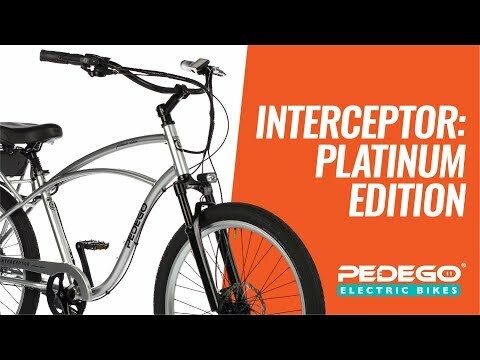 Please visit: https://www.pedegoelectricbikes.com/product/interceptor-platinum-edition/ The Pedego Interceptor: Platinum Edition is for those who refuse to settle for less. It makes America’s best selling electric bike even more lovable with premium upgrades. A high-end suspension fork allows you to effortlessly glide over bumps in the road. Top of the line hydraulic disk brakes stop on a dime with the greatest of ease. The levers are easier to squeeze than mechanical brakes, and they feel more responsive. Aside from these luxurious upgrades, the first thing you notice when you ride an Interceptor is how comfortable you feel. You’ll swear it was made just for you – because it was! The most important part of any Pedego is the person riding it, and the Interceptor is built with only one thing in mind: YOU. But don’t let the laid back style fool you, what really sets the Interceptor apart is its supercharged performance. It’s recognized worldwide as one of the most powerful electric bikes on the market, and it’s just plain fun and exciting to ride. A whisper quiet, 500 watt motor delivers best in class acceleration and hill climbing. The sensation of power it gives you is exhilarating. A state-of-the-art 48 Volt battery uses the same advanced lithium-ion cells as an electric car. It weighs less than a housecat and can take you up to 60 miles on about 10 cents worth of electricity. The Interceptor is fully-loaded with user-friendly features that make riding even more fun. A twist and go throttle delivers full power on demand. Exclusive PedalSense® technology automatically gives you a boost as you pedal. It feels like having bionic legs. An easy to use display keeps you informed and features a USB charger for your phone and other devices. Pedego is a fun company, and yet we’re gravely serious about one thing – uncompromising quality that lasts. Combine Pedego quality with the peace of mind of an industry leading two year warranty, and you’ll be smiling too.